Et everyone enjoyed the trip to SW Ireland. 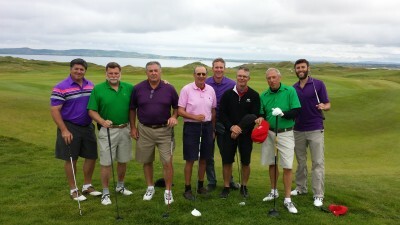 This group photo was taken on the last day at Tralee, which our group voted as the #1 course we played. Old Head and Ballybunion were very close at #2 and #3. It would have been fine to play any one of those links courses more than once!! I personally REALLY liked Tralee…the course is spectacular and extremely interesting. You put together a great trip for us. The bus and driver, Eddie Horgan, were excellent. The hotel was very good, everyone liked Killarney, and the courses were great.